Additional reports "Risk events": The list of available reports now offers six new reports showing threads to the Office 365 tenants - filtered just for the entitled OU's of the signed-in administrator. This report shows successful logins from anonymous proxy IP address that could be used to hide the real device's IP address for malicious intent. This report shows the usage of the Office 365 groups, the storage size in SharePoint, number of messages in Exchange, last activity date and more - all you need to know about your Office 365 groups. OneDrive files report generation: In the users list, a new menu is available for the selected user: Report OneDrive files generates a report about all files of the user that are existing in the personal OneDrive for Business storage and what files are shared with whom. A use case for this report is that if a user leaves the organization, the admin can see what files have been shared with other users. Then, these common files could be transferred to another user's OneDrive, SharePoint site or similar. So, the report shows these shared files as well. A pane opens asking for a notification email address. 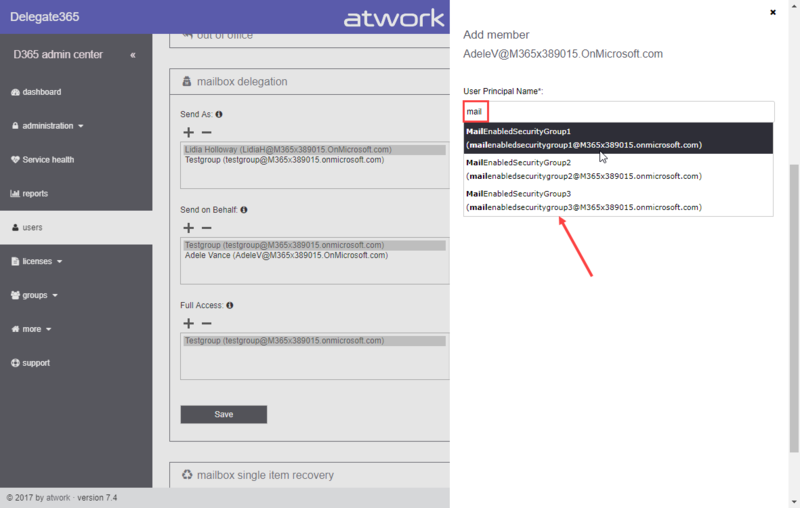 The signed-in admin is automatically existing in the email field. The generation of the report can take a longer time, if the user has thousands files stored, each file must be checked and looked up, if it was shared or not. So, a notification makes sense in most cases to see the report, when it's available. 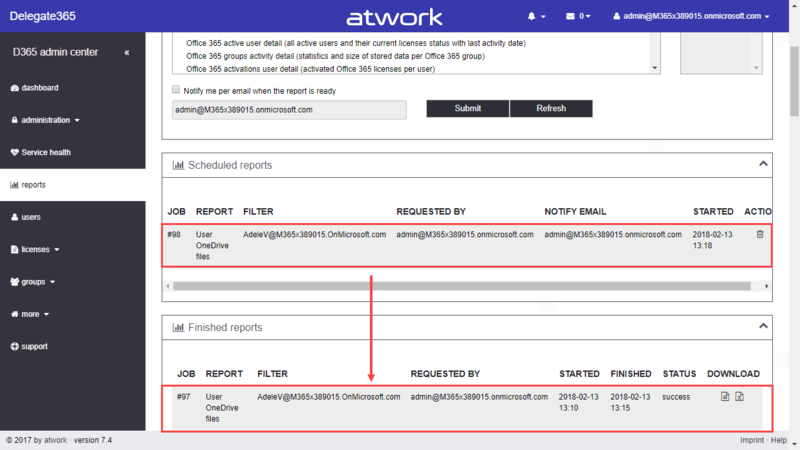 OneDrive files report result: The OneDrive files generated reports delivers all files of the user's OneDrive storage. The report shows one (or more) line(s) per file with name, path, size, and modified date and with whom the file is shared with. The WebURL allows to open a file directly with the Office Web apps to have a quick look at the file (if the user has permissions). ParentPath shows the location of the file in the folder structure to find it easily. 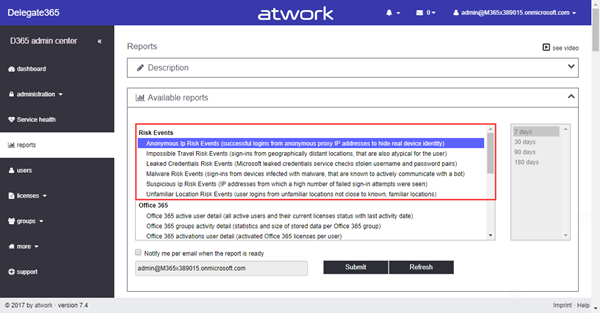 So, this report delivers all files and their status of a user's OneDrive storage. 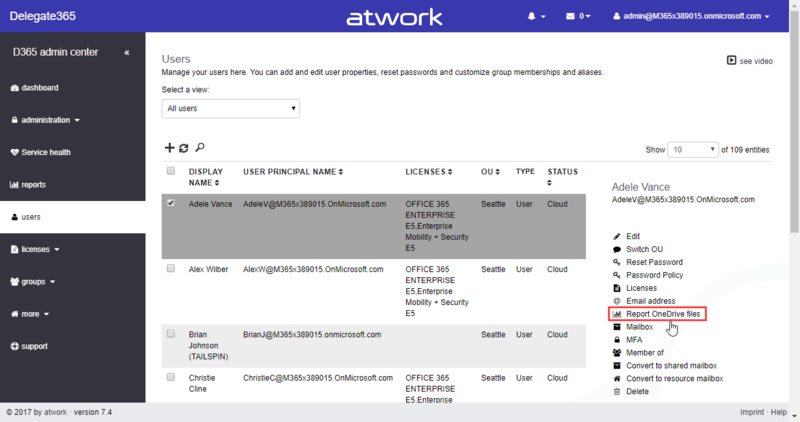 Support for group membership: In Office 365, it's possible to add a Mail Enabled Security Group as member to user's mailboxes, as delegated user in Resources (rooms and equipment mailboxes) and Shared Mailboxes. This does not work for other group types (see Working with Exchange Mailboxes and Groups as members), but for Mail Enabled Security Group only. 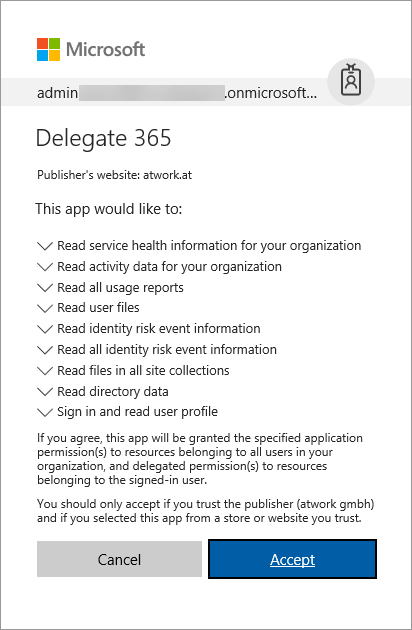 So, this feature has been added to Delegate365. With this update, it's possible to select a Mail Enabled Security Group from the people picker as well. 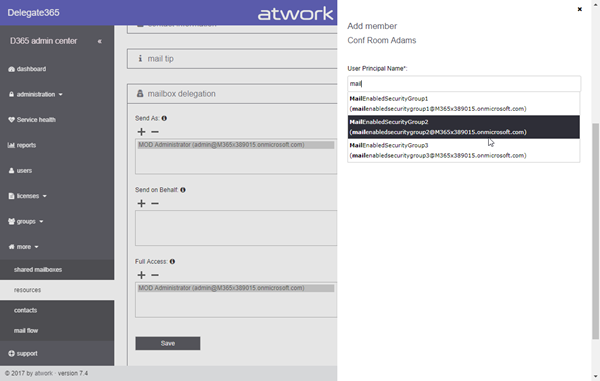 Then, the (new) Mail Enabled Security Group can be added as member for a user's mailbox delegation. In this sample, we assign the group "MailEnabledSecurityGroup1" with the permission Full Access to AdeleV's mailbox. All members of that group have access to that mailbox.